The cool thing about almond butter is you can enjoy it so many different ways. Some people prefer raw, unsalted almond butter where others really enjoy the toasted or roasted variations. You can easily make your own Almond Butter and tailor make it for your taste buds. One of the things to be mindful of when choosing nut butter at the store is to read the ingredients. Purchase almond butter that has the least number of ingredients and less processing. You can also choose to make your own Almond Butter. Thank goodness that over the last few years the cost of almond butter has come down a tad, however, almonds are a more expensive nut. This is another reason to consider making homemade almond butter—it will save you money over the long run as well as give you control over the process and ingredients. Making homemade almond butter gives you an opportunity to practice patience, because you will need it. Almond butter has become more and more popular over the last ten years and rightfully so. In fact these days you can purchase it at most local grocery stores. If you are ready to learn how to make nut butters you will need a good powerful appliance like a Vitamix or a food processor. When you make nut butter in a food processor make sure that you use the S Blade and be prepared to let it run for about 20 minutes to get that smooth and creamy almond butter that you see at the stores. If you like crunchy almond butter then at the end of the blending process, once it is smooth, add more almonds to make it crunchy. The reason it takes so much time to process is that the oils need to be released from the almonds to make the magical transition happen. Whether you use a Vitamix or a food processor, you will need to push the almond paste continuously down off the sides and into the blade during this transformation from almonds to almond butter. The Vitamix has a nice tamper tool so you will never need to turn the machine off during that process and can use the tool push your ingredients into the blade. 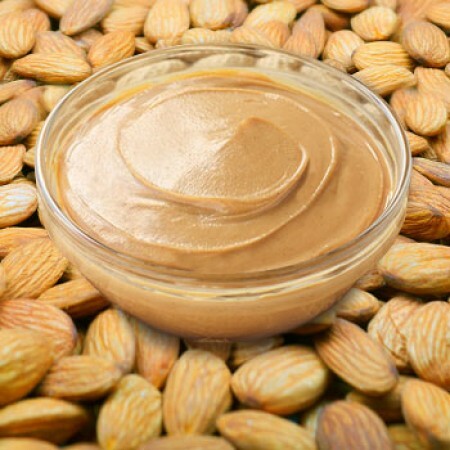 Either tool you use to make your homemade almond butter, you might want to start exploring your own almond butter recipe with about 3 cups of Eatnuts.com Almonds. Have it raw, salted, unsalted, roasted, and even add honey, flax or chia seeds, just use your imagination. Once you make your homemade almond butter you will want to store it properly. Keep in mind that this is homemade, so we are not adding any preservatives and chemicals, so storing it properly becomes even more important. I like to use Mason Jars to store nut butters as I really like the air tight seal. Not only should you keep nut butter sealed, it should also be kept cool. Your homemade nut butter should last about 5-7 days in the fridge. Eatnuts.com Almonds are a great alternative for those with peanut allergies. Almond Butter also has way more calcium, potassium, fiber, magnesium and iron then peanut butter. Other almond butter benefits include its having half the saturated fat of peanut butter. Although it has an overall slightly higher fat content, it has more of the good mono-saturated saturated fats. Both peanut butter and almond butter have their place on our palettes and in our lives. As a healthy food nut I gravitate towards almond butter, however, every now and again I want that good old fashioned peanut butter taste. Many people aren't aware that peanuts are actually a legume, so almond butter is a good option for people that are not able to consume legumes. Of all nut butters, almond butter is one of the best in terms of good fats and nutritional benefits. It is a great alternative for anyone who has a peanut allergy or can’t consume legumes and, although it can be more expensive, it is simple to make at home which makes it much more affordable. If you haven't tried almond butter, I encourage you to get some today. Or better yet, purchase nuts online and make your own homemade almond butter.